Yes folks, it’s almost that time of year again; one marked by BBQ, tex mex, margaritas, ice cold, Lone Star tall boys, and oh yes, music. SXSW. With thousands of bands descending upon Austin, March 12th through the 16th, it’s helpful that the festival’s official website offers up, along with the artist’s bio, an MP3 (when available). But even then it can be a daunting task to wade through them all. 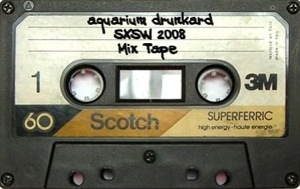 Not to worry, though, Team Drunkard has perused the lists and wrangled up a series of SXSW 2008 mix-tapes for your downloading needs. Drunkard approved, these are made up of bands we’ve seen in the past, or plan on seeing next week. (see the entire official SXSW artist list here). Part 1 of 3. Love the mix. the music off your site is the only thing i listen to anymore. You introduced me to some amazing bands and music. THANK YOU. keep it up. i couldn’t help but notice that all of the band selections (save for one) start with one of the first four letter of the alphabet. i just thought that was interesting. i’m assuming it was on purpose. oh, and i guess they are all from the first four letters of the alphabet.